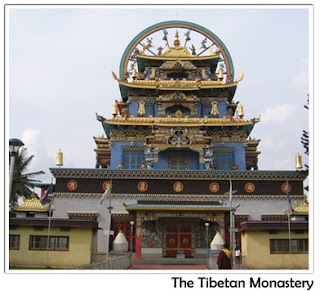 Bylakuppe is the location of "Lugsum Samdupling" (established in 1961) and "Dickyi Larsoe" (established in 1969), two adjacent Tibetan refugee settlements, in the west of Mysore district. The nearest town is Kushalnagar in Kodagu in the State of Karnataka. Namdroling Monastery represents the fruit of the huge investment of time and energy made by Penor Rinpoche. Today, Namdroling Monastery in Byalakuppe is a thriving community and home to thousands of lamas, monks and nuns, making it the largest Nyingmapa teaching center in the world. Those who have studied or are studying at the monastery include all the major lineage holding tulkus and lamas of the Palyul tradition, including the fifth Karma Kuchen Rinpoche, the third Choktrul Rinpoche and the third Rago Choktrul Rinpoche. Their spiritual training is directed and guided by Penor Rinpoche himself. Tulkus of other traditions have also studied at Namdroling, including the Sakyong (Mipham Rinpoche), Minling Dungsey, and Minling Khenchen Rinpoche. Those wishing to visit the monastery must telephone the office at (91)8223-694-318 and attempt to make arrangements with a staff member. * Fly into Bangalore, then take a public bus, passing through Mysore to, Kushalnagar, the town nearest Namdroling. Total trip time is five hours. * No need to get off or change buses in Mysore. Make sure to get off at the correct stop as there is a stop at a small village called "Byalakupee" - which is not the correct stop. Instead continue on a little further to Kushalnagar, where there is a bus station and an Indian town with hotels. 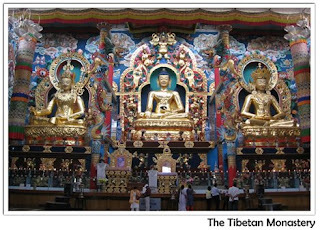 * Once in Kushalnagar, take a ten- minute motor rickshaw to the "Fourth Camp Nyingma Monastery." Or, simply say "The Golden Temple." The trip should cost no more than 30 rupees. * Many visitors take a taxi from the airport to the monastery (6 hours). You should inform the driver that you are going to Kushalnagar, to the Golden Temple. Fare should be approximately 3600 - 4300 rupees. * It is also possible to take a train from Bangalore to Mysore , then a government bus from Mysore to Kushalnagar. * Accommodations are available on the monastery premises or just by the front gate at the Paljor Dhargey Ling Guest House. Most guests stay at the Paljor Dhargey Ling Guesthouse. * Please be forewarned that it is possible that arrangements cannot be made in advance, depending on circumstances. Visitors are advised to keep a contingency plan for accommodations including plans to stay in one of the hotels in Kushalnagar until other plans can be confirmed. * Be prepared as it may not be possible to attend to all visitor needs. Visitors need to be prepared to be completely independent. Correction: As of October 2014, the largest Nyingmapa teaching institution in the world is Serta Larung Five Sciences Buddhist Academy in eastern Tibet. It was started by the late Khenpo Jigmed Phuntsok Rinpoche and houses over 10,000 monks, nuns, and laypeople.